Banksy is the most popular street artist at the moment, possibly the most successful graffiti artist of all time. Whilst you can wait around to see if he’ll pain the side of your house overnight, making you a millionaire by breakfast, you’ll have more luck decorating your home with Banksy art prints, and decals. Banksy’s graffiti gets people talking, and can provide an affordable conversation piece for your walls at home. When in London I love occasionally stumbling across a real Banksy in a run down part of town, although I have gone out of my way to see “Banksy vs the Museum” in Bristol, and the “Village Pet Store And Charcoal Grill” in Greenwich Village. Decals are great, they let you change up your room at a low cost, and they’re easily removed so you haven’t lumbered yourself with a huge redecorating job when you grow bored of them. Have a little fun and put this decalon the wall just above the floor, particularly if you’re not too particular about keeping your home as spotlessly clean as perhaps your mother (or mother in law) would like. For teenagers who would like to paint their room black, decals can be a half way house compromise, add an “edgy” decal now to a bedroom or dorm room, safe in the knowledge that you can take it down when you’re tired of it and replace it with something fresh, without needing 34 coats of paint to cover up. Yes, I was that teen, and yes, it certainly felt like 34 coats, but for that glorious year with my black room with yellow Andy Warhol banana on the wall, I was cool. This little girl with a balloon decal turns a dull stairway into an enticing staircase of possibilities. Who knows where the balloon will lead you. Banksy designs were just made for Apple. With some careful positioning Banksy graffiti art can really make your Apple MacBook look original and add a little personality to it. Here’s one of my favorites, but there’s plenty more to choose from if you’d rather see the Apple logo as a balloon, or as the logo on a placard held by a Banksy character. Perhaps one of Banksy’s more famous street works was from London’s Old Street, it was painted over by Transport for London who have a zero tolerance policy towards graffiti. Elsewhere thieves have stolen entire walls to get their mitts on Banksy’s. Other people have sought to buy houses with Banksy’s attached. A local children’s football club was able to fund their activities by offloading a Banksy from the wall of their clubroom. Local councils in England have mixed approaches. SOme see Banksy’s as great gifts to their cities (Bristol issues a guide map), others paint them over immediately as they class all graffiti as vandalism and destroy it no questions asked. Part of the Banksy brand is that no-one knows who he is. That’s not strictly true, people do know who he is, it’s pretty easy to find out if you have a computer attached to the internet, but that does take away some of the fun. You can look it up if you want, but do you remember how much more magical Christmas used to be when it came down the chimney? Don’t bother with pseudo-intellectuals de-constructing the Banksy ouvre, get the books by Banksy instead and just enjoy his work for what it is. Would You Know A Real Banksy If You Saw One? A few people in New York got far more than they bargained for recently. 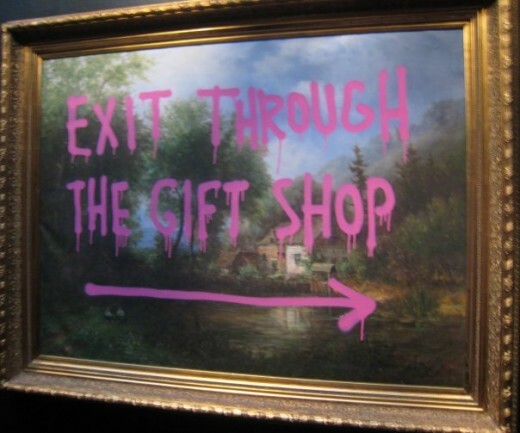 Banksy set up a stall selling his own works for $60 each. Thousands of people walked by, as it looked like any other stall selling knock offs. One shopper got rich by accident.